Commissioned for the London’s Festival of Love, ‘Ventricle’ is a vibrant two-part installation interpreting the mystical power of hanging gardens of Babylon and Eden. Situated in Southbank Center, the installation catches the visitor’s eye immediately with its vibrant colours and shimmering material. Recalling heart, each of the aluminium structures is made of intertwined tubes and clad in 3M’s Solar Mirror Film. 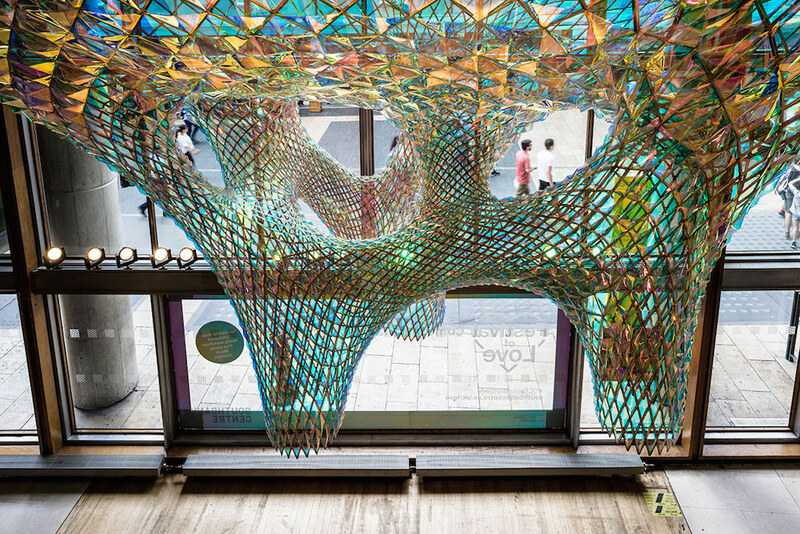 The designers from New York-based studio SOFTlab took advantage of the material’s properties to refract and cast the light to put a woven landscape of colour into the interior of Southbank Center. A kaleidoscope of sunlight reflections, the net-like hanging structures interprets the stories of Babylon and Eden. While the first one was a place of many cultures and languages, the second one symbolizes free knowledge and expression, which appears to be the designers’ response to the main idea of the festival.